If you are looking for licensed professionals with many years of experience who can handle pool repair jobs, no need to look further. We are the premier pool service in Temecula and we handle all aspects of pool care, repair and maintenance. A swimming pool is an excellent outdoor addition to your property. It lets you, your family and friends beat the heat in summers and enjoy a quality outdoor time at your home anytime of the year. However, a pool has to be well-maintained in order to offer year-round fun and recreation. And that is where we come in. 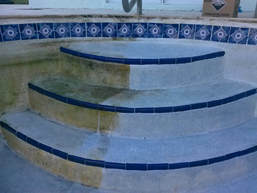 We are a highly-trusted and qualified pool repair contractor in Temecula. Over the years we have worked with countless homeowners in the region who trust us with all their pool, hot tub and sauna repairs. We deal in pool of all sizes and types including wading pools, freshwater pools, saltwater pools, hot tubs and more. No matter what size your pool is and regardless of what kind of repairs you are looking for – we have got you covered. You tell us the problem and we offer a solid guarantee that we will absolutely take care of it. ​Pool Structure Repair: The integrity of your pool’s structure is also vitally important. Even minor damages such as a chipped tile, a minor crack or a hole in your pool will get worse over time if it’s not handled correctly. It may also make your pool unsafe to use. Similarly, even minor structural issues with the hot tub or sauna at your pool must not be overlooked. This stands true for pools constructed from all kinds of materials including plastic, concrete, fiberglass or natural stone. Pool Equipment Repair: Our Temecula pool care experts handle equipment repair as well as repairs related to the structural and other aspects of the pools. When it comes to pool equipment such as pool pumps, filters, cleaners, waterfall, lightning and control panel, you want to be sure that you hire licensed professionals. A repair job in the wrong hands may further exacerbate the problem instead of solving it. Fortunately, we have an in-house staff of pool service experts. These licensed and trained experts have handled all kinds of pool repairs over the years. They are up to date with the technical details of pool equipment from leading brands such as Hayward, Zodiac and Polaris. This means that when they undertake a pool repair job, we really know what they are doing. And they will figure out the rest, we are the most effective and most affordable way to repairing your Temecula swimming pool equipment. Free Evaluation and Quote: To get the damage evaluated for free, get in touch with us today. Our experts will diagnose the problem and give you a free price quote for the amount of work that will go into the repair job. This quote will be provided regardless of whether you eventually hire us or not. Being a trusted pool service in Temecula, this is how we make sure that things remain transparent with our customers. You are informed about the repair costs beforehand and there are absolutely no hidden charges. Emergency Repairs: If you need urgent repairs at your Temecula swimming pool, you can rely on us. We handle urgent pool repairs because we understand that sometimes, you just can’t delay a repair job. This is why we strive to make sure that we repair your swimming pool the very same day. To discuss a repair job, simply get in touch with us and our licensed pool repair experts will be at your doorstep in no time. We promise to deliver top-quality services at an incredibly affordable rate and in an unbelievably timely manner.